In late 2015’s “Surfing Uncertainty: Prediction, Action, and the Embodied Mind,” Andy Clark coined an unusual word to describe how we process information: “We are not cognitive couch potatoes idly awaiting the next ‘input,’ so much as proactive predictavores — nature’s own guessing machines forever trying to stay one step ahead by surfing the incoming waves of sensory stimulation.” Even if you’re a bone-marrow-munching foodie, predictavore probably isn’t part of your vocabulary. This novel coinage is a sign of our voracious times. The -vore suffix has been productive in recent years thanks to food trends like the locavore movement, but food culture is now just one item on this suffix’s menu. Scientists reach for this suffix when trying to describe cognition, referring to humans as informavores or datavores. Slangier variations have emerged, too, such as pizzavore and nerdivore. Increasingly, -vore is becoming a multidimensional tool for talking — often with pride — about what or how we swallow. Locavore has been one of the most popular new food words of the 21st century since its explosion in popularity in 2007 when it was Oxford University Press’ Word of the Year. 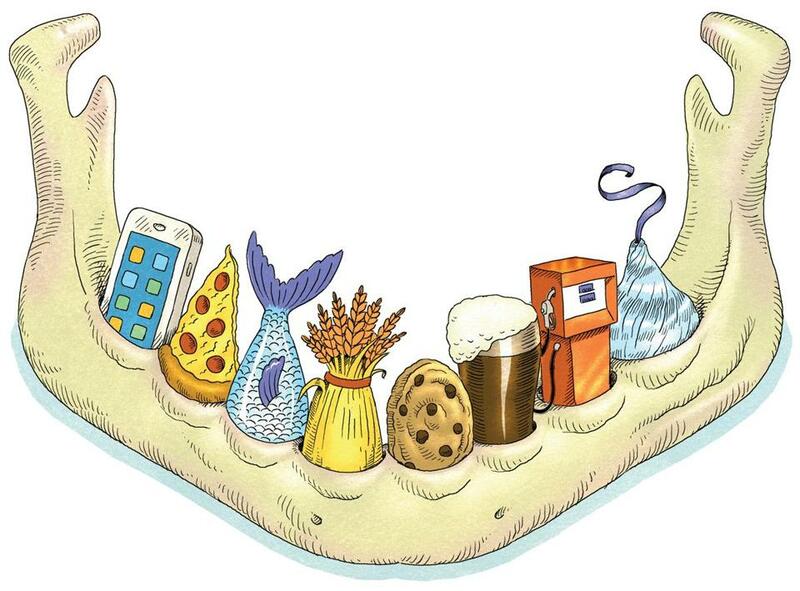 As eating locally has gone from trend to common practice, locavore boosted the lexical stock of the -vore suffix, spawning new words and reviving older ones. The opportunivore eats anything available: It’s essentially a rebranded dumpster diver. Vegivores are not-quite vegetarians, eating occasional meat or fish: You could also call these flexible eaters flexivores. On his Double-Tongued Dictionary site, Grant Barrett recorded a few remarkable coinages, such as invasivore (someone who eats invasive species), distavore (the opposite of a locavore, eating food from distant locales), and retrovore (someone who eats food prepared in an old-fashioned or traditional way). Locavore also inspired a rhyming word with a similar meaning: A locapour only drinks local craft beer or other beverages. These words are related to voracious, but they spring directly from Latin words that classify animals, such as the order carnivora. Besides those meat-eaters, major groups include herbivores and omnivores, which eat plants and anything, respectively. Scientists have turned to this suffix when discussing more specific diets, too. Some animals are insectavores; others are nectarvores. A piscivore eats fish, while fish that eat plankton are planktivores. An 1882 issue of Nature mentions a “serpentivorous bird.” Other birds have been described as vermivorous, which sounds more dignified than worm-eating. The Oxford English Dictionary even has an example of the rare noun vermivorousness, which would score big at Scrabble. Slang is another area where suffixes flourish. Much like -pocalypse, -mageddon, -palooza, -tastic, and -splain, -vore can get attached to just about anything, especially online. As the Life of a Pizzavore blog describes it, a pizzavore is, “An animal that derives its energy and nutrients from a diet consisting solely on pizza.” Depending on your preference, you can be a chocovore, pastavore, or cookievore. Some odd words pop up such as anti-marinovore, a person who doesn’t eat fish. If you have a passion for nom-noming to match Cookie Monster or a Lolcat, you’re a nomnivore — and sometimes a nom-nom-nomnivore. If you’re a cannibal or zombie, you’re a peoplevore. Meanwhile, a gas-guzzling vehicle is a fuelivore. As Anne Curzan, professor of English at the University of Michigan and regular contributor to the Lingua Franca blog, said in an e-mail, such words tend to be “especially creative and playful” because “the metaphorical possibilities of what we ‘consume’” contrast with the technical origins. A nerdivore would likely appreciate some -vore words that merge consumption with cognition. One particularly successful variation has been informavore, a term that applies well to people, particularly in the age of information overload. This word goes back to at least the 1980s, though it made a bigger splash later in places like Steven Pinker’s 1997 book “How the Mind Works” — “. . . we would expect organisms, especially informavores such as humans, to have evolved acute intuitions about probability.” The variation infovore has also been successful: It was the Macquarie Dictionary’s 2013 Word of the Year. A related word is datavore, which has gained currency thanks to the prominence of Big Data. A Wired article discusses “the datavore and the data-bloated,” drawing a line between companies that are successfully digesting data and those that are just becoming overloaded and overwhelmed with incomprehensible information. That distinction points to the two sides of voraciousness: We eat to survive, but we also overeat. You don’t have to be much of a techno-skeptic to question the healthiness of our informavore diet. Such anxieties are personified by ravenous, ever-popular vampires and zombies, who highlight our mixed feelings about consuming and being consumed. All -vore words — from the slangy to the scientific — are evidence of the unpredictable life of words and our literal life as organisms. But the real message of most recent -vore words is pride. We’re not content to eat locally or read nerdily: We want to let people know about it, on our dating and Facebook profiles. Parents like to say “Eat your dinner” and “Feel good about yourself.” Words like locavore and pizzavore allow us to do both at once.